Are you ready venture onto an uncharted island where kids survive and thrive? Your Shipwrecked Ultimate Plus Digital Starter Kit is packed with everything you need to get started on a VBS experience where kids are anchored in the truth that Jesus carries them through life's storms. This kit includes physical resources and samples just like the standard starter kit, but it also comes with the Digital Download Access Pack. This pack includes a USB drive loaded with digital leader guides, music, videos and more. It opens up all-new ways to manage, share, and utilize your VBS content. The Shipwrecked Ultimate Starter Kit Plus Digital allows you to deliver resources with the touch of a button. You can hand volunteers the manuals from your Starter Kit or e-mail pdf’s so they can use whichever format feels most comfortable. The Plus Digital kit also safeguards against leaders who might lose that that ever-important Sing & Play manual at the 11th hour. Digital Download Access Pack: A USB drive loaded with a complete set of Digital Shipwrecked resources. Shipwrecked Ultimate Director Go-To Guide®: The ultimate step-by-step resource for planning, recruiting, promoting, training and...well, everything a successful director needs. Leader Manuals: The easy-to-use, field-tested guides make it a snap for your station leaders to lead kids through the best VBS experience ever! Imagination Station Sampler: With this complete collection of Imagination Station activities you'll see how each daily Bible point is reinforced through fun, memorable, totally kid-friendly discoveries. Student Materials Sampler: This sampler lets you preview the awesome Bible-teaching resources designed exclusively for today's kids. Music: Your kit includes the Leader Version of the Shipwrecked music, featuring the full music CD, instrumental-only tracks, and song lyrics slide show. Clip-Art: An awesome collection of graphic resources, guides, schedules, bulletin inserts and more! Media: Your starter kit includes the Decorating Places DVD, Ultimate Director Go-To Recruiting and Training DVD, KidVid Cinema DVD, and the Sing & Play music DVD. Missions and More: Your ultimate starter kit also includes a missions project sampler plus information on lots of other one-of-a-kind VBS resources. Shipwrecked Catalog: Packed with tons of resources to help you make Shipwrecked an easy-to-plan and unforgettable VBS event. I love that it had the Digital Pack so that it was easy to upload to the computer as we use this for all our programing. <br>Starter Kit is very informative and has everything you need for explanation of what all to do. Group always puts together a great VBS and the starter kit always provides all the information you need for getting started. My only complaint is that I don't think that this year the "logbooks" are worth the price. They're beautiful, but barely integrated into the program, and quite honestly just not worth the price. My church will be skipping them. Have used this curriculum for many years and the Kit basically serves us well. Wonderful kit! Samples of everything important to give us a sense of what it’ll be like before ordering. Digital files are very helpful. all the hard work solved! The books really help plan every detail. It was great to give each leader a book with all the information. Had a lot of information, and everything you could imagine included! I was able to sort through and decide which pieces we were going to use and which pieces we weren't! This curriculum is easy to customize to fit your particular church! Love Group VBS. Love the digital. They only thing I wish I could have is a master list of what is needed by day and station. If it is available it is hard to find. Very inclusive! 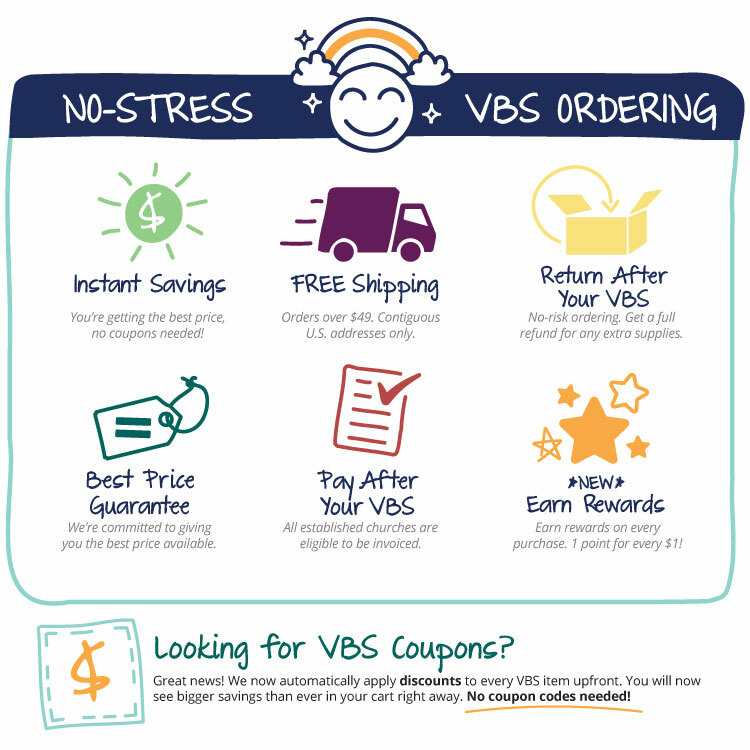 Has everything you need for an awesome VBS!